Johnny Stocks: Weekly S&P Chart - Flash Crash Part II ? Weekly S&P Chart - Flash Crash Part II ? The weekly RSI on the S&P 500 reached 76.17 less than a month ago. That was the most overbought the weekly RSI had been in almost 7 years. 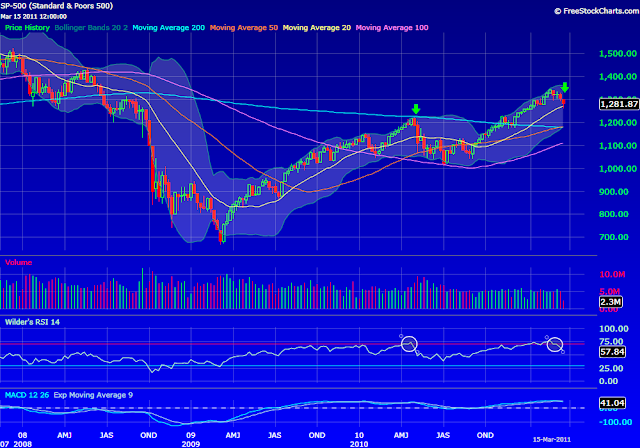 Looking back to the beginning of 2008 there's only been one other instance where the weekly RSI breached the 70 level. That was in Apr/May 2010. During the week ending Apr 30, 2010, after reaching a high of 72.62, the weekly RSI dipped back below 70 (the red line in the chart). The very next week the S&P suffered the flash crash (on Thursday, May 6, 2010), quickly losing 10% of it's value. Fast forward less than a year later and, after hitting a high of 76.17, the weekly has RSI dipped back below the 70 level in an eerily similar fashion just this past week. While I'm not suggesting we see a similar "flash crash" this week, I do think the chart is warning of a potential selloff in the very near future. I have been short over the past 2 weeks and added to shorts this afternoon after the market bounced off its lows. If we get a dead cat bounce back to the 1300/1305 area this week I will look to add to short positions again. Above 1305 would force me to reconsider my view. Professional trader for 15 years. Stocks, commodities, currencies. MBA, CFA. Can Markets Rally On April Fools' Day? SENSIO Update - Is 3D Really Dead? Get up to $250* when you transfer your account to tradeMONSTER! Have You Made Your Wish List Yet?